Be the first to share your favorite memory, photo or story of Lenora. This memorial page is dedicated for family, friends and future generations to celebrate the life of their loved one. 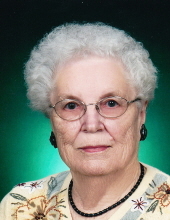 Lenora R. “Lennie” Quackenbush age 98 of Bloomington, IL formerly of Indiana passed away at 4:18 AM on Saturday, February 9, 2019 at LeRoy Manor Nursing Home, LeRoy IL. Her memorial service will be 11:00 AM Friday, February 15, 2019 at Wesley United Methodist Church, Bloomington, IL. Rev. Justin Iverson will be officiating. Visitation will be 10:00 AM- 11:00 AM Friday, February 15, 2019 at Wesley United Methodist Church, Bloomington, IL. Inurnment will be at a later date in St. Joseph Valley Memorial Park Cemetery, Granger, IN. In lieu of flowers the family suggests memorials be made to Wesley United Methodist Church, Bloomington, IL. Arrangements are being handled by Calvert & Metzler Memorial Home, Bloomington, IL. Lennie was born August 30, 1920 in Washington, IN the daughter of Earl Raymond and Jennie Pearl Barber Reeve. She married James Quackenbush on March 2, 1946 in Indianapolis, IN. He passed away November 30, 1969. 6 great-grandchildren, Ciarli, R.J.,Kylie, Madeline, Amalia, Ryan and a daughter in-law Pat Quackenbush, TX. Lennie is preceded in death by her parents, her son, James Michael Quackenbush, 6 sisters, 1 brother, 1 grandson and 1 great-grandson. "Email Address" would like to share the life celebration of Lenora R. "Lennie" Quackenbush. Click on the "link" to go to share a favorite memory or leave a condolence message for the family.